Newspaper of the year – The Fiji Times: As a crusading daily under the helm of battling Netani Rika, it is hard to go past this Australian-owned publication – the strongest daily newspaper in Fiji in spite of its past political baggage and track record that goes right back to its colonial days in Levuka. While Bainimarama’s regime regularly chokes for breakfast over this Murdoch paper and blames it (along with Fiji Television) for the “need” to impose its promised/threatened new media law, the rest of the region can thank Rika and his team for keeping up the good fight and exposing life under media censorship. But we should not get carried away with the accolades. The Times still has plenty of flaws in both its coverage and strategy. The region also needs to acknowledge the courage of many other journalists in Fiji and the resolve and commitment of other media in tackling the regime in rather more subtle and intriguing ways. Things need to be kept in perspective globally too, there is a quantum leap between the relatively mild (but inexcusable) press freedom abuses in Fiji and the truly repugnant violence against media in such countries as Burma and even in a democracy such as the Philippines where 30 journalists can be assassinated by private militia in one dreadful killing field obscenity and when Filipino radio talkback broadcasters or reporters, in particular, can be murdered with near impunity for exposing corruption. Media film – Balibo: The on screen version of the murder of five journalists working for Australian news media – two Australians, two Britons and a New Zealander – by Indonesian special forces invading East Timor on 16 October 1975 has revived controversial and painful memories. Not only has the Robert Connolly film reflected on the wounds of the past, and even stirred the wrath of the widow of the lead journalist killed, Greg Shackleton, it has triggered debate about journalistic professionalism in an age when bravado was perhaps more important than the safety concerns dominant today. Balibo can be labelled a political film, a war film, a human rights film, or a journalism film. After the Makassar screening, discussion focused on the journalism. The question asked: As journalists, what can you learn from the film? In covering a conflict, it tells you to make a choice. Either you stay or you go, replied one participant. “I would go,” he said emphatically. Most of the 31 journalists present agreed. 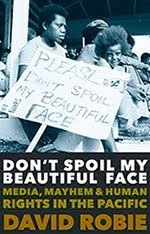 The majority argument was to leave the war zone, prioritising safety and the ability to continue reporting in the future. At least two participants, however, insisted they would stay for the story because it was “too big a story to miss”. Basorie claimed the five murdered newsmen were “embedded journalists” – embedded with Fretilin. Independent newspaper – Wansolwara: The student journalism newspaper published by the University of the South Pacific deserved to win the Ossie Award for regular publications this year for publishing under a state censorship regime. Not only did the courageous students publish a special edition examining the media in Fiji under a military regime, but they also reported global warming, environmental issues and human rights in the region. Wansolwara, which has not only won the most Ossie awards of any publication in Australia, NZ or the Pacific (10, plus it scooped the pool in 2000 with the online and print coverage of the George Speight coup). For 13 years, the newspaper has been self-funded by the students themselves through advertising revenue. But this year, the students brought off a coup themselves – with a deal to publish their newspaper as a liftout in the daily newspaper Fiji Sun. This immediately lifted their circulation from 2000 to more than 20,000. Unfortunately the Reader’s Digest judge surprisingly overlooked this newspaper’s achievements and quality and awarded the “best regular publication” prize to AUT University’s Te Waha Nui instead. Incidentally, for those with special concerns on internet freedoms, it is good news that Lucie Morillon has been appointed as the new head of RSF. She established the RSF office in New York five years ago and has long been a champion of online free speech. The efforts of the new Pacific Freedom Forum, the International Federation of Journalists and the Pacific Media Centre's Pacific Media Watch also deserve praise for their specifically Oceania work. Independent blog – Croz Walsh’s Fiji: Crosbie Walsh is not actually a journalist. However, as an adjunct professor and retired founding director of the University of the South Pacific’s Development Studies programme, he is an acute observer and commentator about facts and falsehoods about Fiji. Thrust into blogging almost by accident (he became rather frustrated over poor media coverage of the realities in Fiji), he established his own excellent and reliable information and analysis website in a bold attempt to make sense of the complexities of Fiji’s political, social and economic order since the 2006 coup. A Tamara McLean article in the NZ Herald/AAP provides readers with a rehash of what was once news, and "fresh" comments from "an Auckland University academic sympathetic to Bainimarama" (Prof Hugh Laracy) countered by three "Pacific specialists (Dr Jon Fraenkel, Jone Baledrokadroka and Prof Brij Lal) at the Australian National University" who are not." The use of "academic" and "specialists" tells readers where Tamara is coming from, but it's neither subtle nor accurate for all four are academics and specialists. 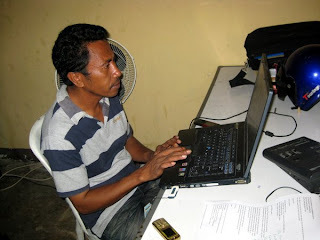 Special freedom of speech award - José Belo: For remaining defiant in the face of threats and a legal onslaught over his exposes of corruption that could have le d to imprisonment in East Timor. He was ultimately saved by the collapse of the trumped up “criminal defamation” case against him and Tempo Semanal. 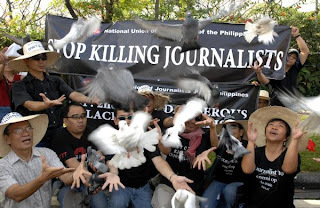 Pictured: A National Union of Journalists of the Philippines (NUJP) protest against the killing of media workers (Photo: Bayanihan Post) and José Belo of East Timor at work (Photo: Etan). How should we respond to Balibo? 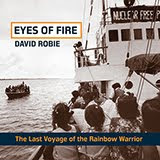 Bula and congratulations on making David Robie's list. I have followed your blog and would like to point out the "X" factor variable. Most of the people who supported Qarase (including my elite friends) are the rich, powerful and urbanites. A lot of my friends who were connected to the SDL became rich overnight. These are the people who have PCs at home and can read and comment on the numerous blogs. These are the people whom Frank Bainimarama has "neutralised" and, they in turn wage a campaign of misinformation against his administration. Included in this list are politicians, lawyers, NGOs and foreign governments. The people who support the regime are the poor and marginalised and a lots of expats and investors who agree with his will to rid corruption from our system. Except for the expats and the investors, the majority of Frank's supporters do not own or have access to computers. Most live in the poor settlements, villages and outer islands. This is the "X" factor when considering your survey and the type of respondents you would encounter. Continue the good fight on behalf of the people of Fiji. While I have a great deal of respect for David Robie and his Cafe Pacific, the same feeling does not extend to his award criteria in awarding the Fiji Times an award for fighting what they helped create in the first place- an unstable Fiji through their jaundiced, unbalanced, blinkered and racially-spiced reporting that has been cause of much racial strife in Fiji. I suppose while we study about development journalism, nobody at the Fiji Times knows the meaning of this. As a First -world -owned paper in a third world country, somehow Fiji Times fails to understand that they are still operating in a developing nation unlike Australia and New Zealand. How come it is deserving of such an award when they consistently abdicate their responsibility in informing the people of what is happening in the country in a “positive’ sense. Never mind how much they despise Frank, they (Netani Rika and the Fiji Times) need to be pragmatic and realise that Frank is in the driver's seat, so what he says should have been at least told to Fiji people. Despite what you feel, HE IS THE CURRENT LEADER OF FIJI. They failed to report Bainimarama’s New Year message and fail to tell about positive developments elsewhere in the nation. Fiji Times is a shame to any media in a developing country. They are most undeserving of the award. Hence the credibility of the award becomes questionable when the media that gave a new meaning to the term "skirt journalism" gets this special award. Great to hear a blog site got your award. 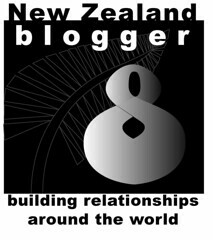 Croz Walsh does good work and is a model for other bloggers of lesser integrity. Croz gets opinions,and publishes thoughtful replies too. The Fiji military can learn a lot from this. I learn something about Fiji, which the government keeps trying to stop me from doing!!!! All this and not a single mention of world journalism in crisis. Also less evaluatory than might have been about the historic role of a couple of volunteer groups. Pacific Freedom Forum and the Pacific Islands Journalism Online are the practitioner-led forums to take hold, with literally thousands of emails exchanged in little more than a year. Yes, conflict of interest has to be declared here as a participant in both PFF and PIJO. Just some contrary viewpoints, feedback, critique, if you like. I must say that I'm at a complete loss to understand why you've given this award to the Fiji Times. I've just spent two weeks in the country and every day, I lined the FT up against its main competitor, the Fiji Sun. No contest. The Fiji Sun is a far better paper, with more relevant news, better headlines and far better layout. I can only assume this is an encouragement award for Netani Rika, because any suggestion that he presides over excellence is risible. Thanks Dr. Robie for your encouraging words about the USP journalism training newspaper, Wansolwara. I am the 2009 Wansolwara editor and a graduating journalism student. Unfortunately, we did not enter the "best regular publication" for the 2009 Ossie awards but we enterd the best news s troy category and received a commendation. We receive Te Waha Nui in our newsroom. It is an excellent paper and worthy of the award. I want to add that the learning and exposure I recieved while a student at USP was just amazing. The Wansolwara production took a lot of sacrifice and hardwork, but in the end it was is very rewarding. I want to thank the student editorial team for their dedication in making Wansolwara successsul because it would not have been possible without teamwork. I was selected by the Secretariat of the Pacific Environment Programme (SPREP), to attend their workshop in Samoa in September to be part of their Pacific Communications Team to COP15 last year. It was great exposure. I learnt a lot. I appreciate the faith SPREP showed in USP Journalism students. David, as the former HOD of USP journalism, you set very strong foundations here. I’m sure you are proud that Wansolwara is still going strong and of the progress students are making. Rachna, indeed ... I am delighted to see the progress af all the old Wansolwara hands over the years - the so-called Piloksies. And congratulations to founding editor Stan Simpson for becoming head of news at Fiji Broadcasting! Good luck for your own career.